In almost every recipe of meat or steak we see the instruction to slice the meat against the grain. This is very much important and every chef maintains it carefully. But often they don’t explain it clearly. Do you know why it is so important to slice the meat against the grain? Or do you know what exactly grain means? Many people really don’t know about it. Do you ever think about this? If you do then this will help you. So to know about it just read. I will explain what actually grain is and also the importance of slicing meat against the grain. Don’t think this grain is like faro or barley, it is completely different thing. The grain of meat actually refers the direction in which the muscle fibers are aligned. Let me show you a picture to clearly understand that. Look on the above picture carefully. The fibers run vertically from the top to bottom. So now you can easily identify the grain of the meat in certain cuts of meat. But in tougher cuts like hanger, skirt steak, flank- you can see it more clearly and it’s easier to define. The cut of meat is not the only thing that determines the tenderness of the meat. This is also important how you cut the meat. You always need to find the direction of the grain and cut across it. Cutting through the fiber and shorten them is make you comfortable to chew through and makes the meat more tender rather than cutting in the direction they run. If you have to face trouble while chewing the meat, you will not enjoy eating it. If you slice the meat with the grain, it will leave a chewing piece of meat or you have to end up with shreds which could have been tender more only just if you slice it against the grain. So it is really very important how you are slicing your meat. Another thing is necessary that is choosing the knife for cutting your meat because depending on cuts there are different types of knives for cutting meat. So choose it properly to make things easier. Look here carefully, the horizontal lines are going left to right of the meat. This is the grain. Don’t cut the mean in this same direction of the fiber going. Now take a slicing knife and cut across the line. If you do so then you don’t need to chew through the fibers because the knife will have already done this work for you. This is really a very simple and efficient trick for slicing meat and it also helps to make the dish delicious. For some kind of cut slicing against the meat refers to the direction to slice the meat across the width instead of length. When you will be going to slice this kind of meat, many people will recommend slicing it thinly at 45 degree angle. But I will suggest if the steak is thin like flank steak or skirt steak you don’t have to be worried about 45 degree. But it is true that angled stripes are more elegant. You can visit Cutlery Advisor to know more about the best knives which will help you to cut meats easily and you will have a good idea on which knife is good for which cuts of meat. For making some delicious recipe of meats you should have known to some popular cuts of it. This will help you to choose the perfect piece of cut to prepare your dish. So let’s see some of the popular cuts. Tenderloin: It is a very common and most expensive steak which is a cut from the area under the rib. This steak cut is comparatively thicker. New York Strip: This is a large chunk of meat which is the cut from the shorter loin area behind the ribs and it is boneless. T-Bone: This cut holds the both Tenderloin and New York Strip. It has a buttery and juicy taste. 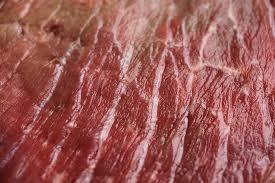 This is actually a cross section of unfiltered short loin. 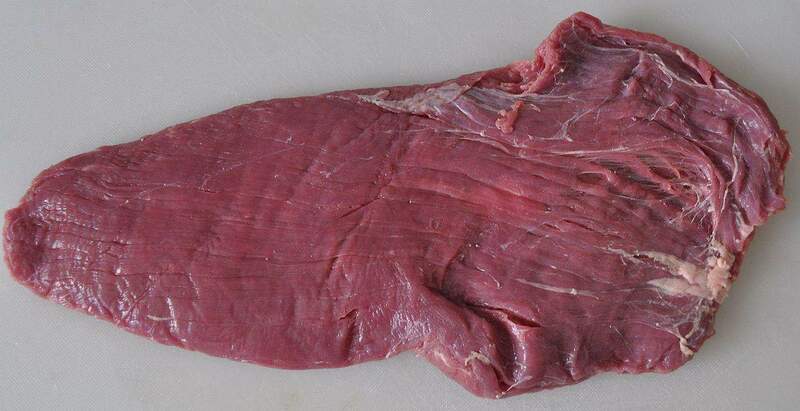 Flank: This is one of the most popular cuts of meat. This has lots of connective tissues and you know obviously you need to cut it across the grain in thin slice. Rib Eye: The rib eye is the most favorite to all steak lovers around the world. It I luscious marbling that makes it very tender and juicy. This cut is completely boneless. So here are some popular cuts of meats and previously I also told how you should slice meats for having those more comfortably and obviously it will increase the taste. I hope this article will help you to prepare delicious recipes of meats and steaks. Happy cooking. The Founder and Editor of eHomeRemedies.com, Melissa J. Torres has spent the last decade furthering her education, earning her Master of Science in Personalised Nutrition and launching her own nutritional medicine clinic. eHomeRemedies.com is a participant in the amazon services llc associates program, an affiliate advertising program designed to provide a means for sites to earn advertising fees by advertising and linking to amazon.com. amazon, the amazon logo, amazonsupply, and the amazonsupply logo are trademarks of amazon.com, inc. or its affiliates. Copyright text 2018 by eHome Remedies.